OUR very first experience of exceptional sweetness — a dollop of buttercream frosting on a parent’s finger; a spoonful of strawberry ice cream instead of the usual puréed carrots — is a gustatory revelation that generally slips into the lacuna of early childhood. Sometimes, however, the moment of original sweetness is preserved. A YouTube video from February 2011 begins with baby Olivia staring at the camera, her face fixed in rapture and a trickle of vanilla ice cream on her cheek. When her brother Daniel brings the ice cream cone near her once more, she flaps her arms and arches her whole body to reach it. Considering that our cells depend on sugar for energy, it makes sense that we evolved an innate love for sweetness. How much sugar we consume, however — as well as how it enters the body and where we get it from in the first place — has changed dramatically over time. Before agriculture, our ancestors presumably did not have much control over the sugars in their diet, which must have come from whatever plants and animals were available in a given place and season. Around 6,000 BC, people in New Guinea began to grow sugarcane, chewing and sucking on the stalks to drink the sweet juice within. Sugarcane cultivation spread to India, where by 500 BC people had learned to turn bowls of the tropical grass’s juice into crude crystals. From there sugar traveled with migrants and monks to China, Persia, northern Africa and eventually to Europe in the 11th century. For more than 400 years, sugar remained a luxury in Europe — an exotic spice — until manufacturing became efficient enough to make “white gold” much more affordable. Christopher Columbus brought sugarcane to the New World in 1493 and in the 16th and 17th centuries European powers established sugarcane plantations in the West Indies and South America. Sugar consumption in England increased by 1,500 percent between the 18th and 19th centuries. By the mid 19th century, Europeans and Americans had come to regard refined sugar as a necessity. Today, we add sugar in one form or another to the majority of processed foods we eat — everything from bread, cereals, crunchy snacks and desserts to soft drinks, juices, salad dressings and sauces — and we are not too stingy about using it to sweeten many raw and whole foods as well. A few journalists, such as Gary Taubes and Mark Bittman, have reached similar conclusions. Sugar, they argue, poses far greater dangers than cavities and love handles; it is a toxin that harms our organs and disrupts the body’s usual hormonal cycles. Excessive consumption of sugar, they say, is one of the primary causes of the obesity epidemic and metabolic disorders like diabetes, as well as a culprit of cardiovascular disease. More than one-third of American adults and approximately 12.5 million children and adolescents in the US are obese. In 1980, 5.6 million Americans were diagnosed with diabetes; in 2011 more than 20 million Americans had the illness. The argument that sugar is a toxin depends on some technical details about the different ways the human body gets energy from different types of sugar. Today, Americans eat most of their sugar in two main forms: table sugar and high-fructose corn syrup. A molecule of table sugar, or sucrose, is a bond between one glucose molecule and one fructose molecule — two simple sugars with the same chemical formula, but slightly different atomic structures. In the 1960s, new technology allowed the US corn industry to cheaply convert corn-derived glucose intro fructose and produce high fructose corn syrup, which — despite its name — is almost equal parts free-floating fructose and glucose: 55 percent fructose, 42 percent glucose and three percent other sugars. Because fructose is about twice as sweet as glucose, an inexpensive syrup mixing the two was an appealing alternative to sucrose from sugarcane and beets. Regardless of where the sugar we eat comes from, our cells are interested in dealing with fructose and glucose, not the bulkier sucrose. Enzymes in the intestine split sucrose into fructose and glucose within seconds, so as far as the human body is concerned sucrose and high-fructose corn syrup are equivalent. The same is not true for their constituent molecules. Glucose travels through the bloodstream to all of our tissues, because every cell readily converts glucose into energy. In contrast, liver cells are one of the few types of cells that can convert fructose to energy, which puts the onus of metabolizing fructose almost entirely on one organ. The liver accomplishes this primarily by turning fructose into glucose and lactate. Eating exceptionally large amounts of fructose taxes the liver: it spends so much energy turning fructose into other molecules that it may not have much energy left for all its other functions. A consequence of this energy depletion is production of uric acid, which research has linked to gout, kidney stones and high blood pressure. The human body strictly regulates the amount of glucose in the blood. Glucose stimulates the pancreas to secrete the hormone insulin, which helps remove excess glucose from blood, and bolsters production of the hormone leptin, which suppresses hunger. 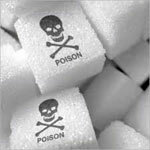 Fructose does not trigger insulin production and appears to raise levels of the hormone grehlin, which keeps us hungry. Some researchers have suggested that large amounts of fructose encourage people to eat more than they need. In studies with animals and people by Kimber Stanhope of the University of California Davis and other researchers, excess fructose consumption has increased fat production, especially in the liver, and raised levels of circulating triglycerides, which are a risk factor for clogged arteries and cardiovascular disease. Some research has linked a fatty liver to insulin resistance — a condition in which cells become far less responsive to insulin than usual, exhausting the pancreas until it loses the ability to properly regulate blood glucose levels. Richard Johnson of the University of Colorado Denver has proposed that uric acid produced by fructose metabolism also promotes insulin resistance. In turn insulin resistance is thought to be a major contributor to obesity and Type 2 diabetes; the three disorders often occur together…..